Baby can rest easy in our stylish and portable sleeping basket. Moba comes in nine modern colors to fit any nursery’s decor. Not just a pretty face, Moba has important safety features that traditional bassinets and moses baskets lack. Moba can be thoroughly cleaned. Anti-microbial and hypo-allergenic properties make it ideal for baby's sensitive skin. Designed along side health care professionals and mid-wives to create the safest sleeping environment. Moba has over 300 air holes along the sides and base. No hood, no padding, no frills, ensuring maximum airflow to your little one. Completely recyclable and made in an ISO approved factory. Produced with a small carbon footprint. Moba mattress is hypoallergenic and PVC free, so it’s perfect for a baby’s sensitive skin. Its wipe-clean top cover is temperature-regulating, fully air-permeable, and reversible.The 3D printed fabric is designed to draw fluids away from the body, keeping babies more comfortable as they sleep. Both the cover and inside mattress are completely washable. Inside cover and mattress are made from safe polypropylene. Not treated with any flame-retardants. Moba liner is made from 100% pure white cotton waffle. 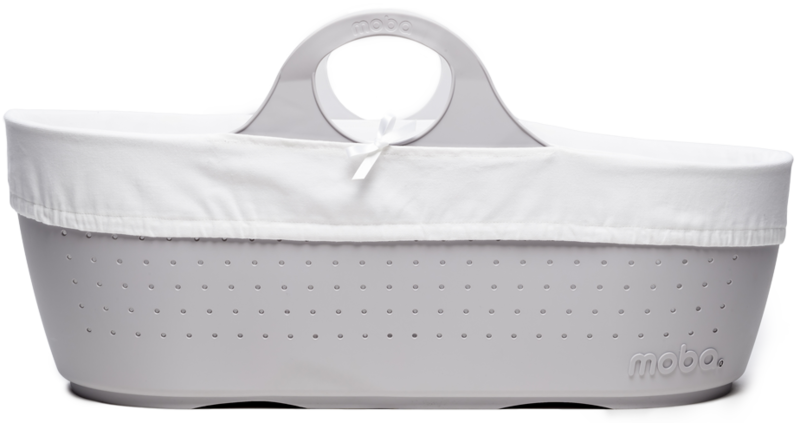 The lightweight cotton is highly breathable to compliment the ventilated sides of the basket and ensure maximum airflow to baby. Health professionals and SIDS experts advise not to use padded or quilted liners, as they can cause risks with overheating. Machine washable.